Read VidPaw Reviews about is it safe to use or not? VidPaw YouTube Video Downloader can also work as an online video streaming platform and YouTube to MP3 Converter. Have you ever wanted to download online videos from different platforms such as YouTube, Facebook, Instagram, Twitter, etc., which have lots of video resources and are free to access to? Actually, there will be many useful videos on these video sharing sites and there must be the ones you need. For example, some daily life skills teaching videos, online mini lessons, funny animal videos, vlogs from celebrities, movie trailers, music videos, and so forth. To download these online video resources, instead of using software, an online video downloader would be most people’s choice because it is easy-to-use and will occupy no extra space. Among countless of online video downloaders, the best one among them - VidPaw - will be introduced to you today. How to Download YouTube Videos to PC with VidPaw? Part 1. What Can VidPaw Do? Rather than a simple downloader, VidPaw YouTube Video Downloader can also work as an online video streaming platform and YouTube to MP3 Converter. VidPaw allows users to download online videos and audios from over 1,000 sites without any limitation. It would be a great choice for you to save the rich online video resources for offline stream back. Support downloading videos from more than 1000 sites such as YouTube, Facebook, Instagram, Twitter, and so on. Allow to use on various devices, including iOS, Android, Windows, Mac, etc. Provide high output quality for both video (up to 8K) and audio (up to 320kbps). Offer other 5 free solutions for users - Facebook Video Downloader, Twitter Video Downloader, Instagram Video & Photo Downloader, YouTube to MP3 Converter, and Subtitle Downloader. Have no internet connection or you are in a poor network environment. The video streaming platform is down (YouTube, Instagram...). Fail to finish watching a long video in one time. Seek for a tool to convert online video into MP3 format for saving the audio file. VidPaw can satisfy all these users with its functional features. For example, when the video streaming platform is down, you can alternate to VidPaw and use its video online streaming function. Just search the video in VidPaw directly and play it with your preferred quality. When your network connection is not reliable enough for online streaming, predownload the online videos can also be a good choice. Use VidPaw online video download or its free solutions to save online videos from different platforms for offline playback. When you meet some high quality and wonderful music videos on YouTube, with VidPaw YouTube to MP3 Converter, you can convert YouTube music video to MP3 and transfer it to your portable devices for playing at anytime you like. It should also be noted that VidPaw is going to release a VidPaw App for Android users to enjoy online video streaming and downloading services more conveniently. VidPaw is a great online downloader with more free functions equipped at the same time. With only VidPaw, you can do lots of things with the rich video resources online. Part 2. Is VidPaw Safe? For the people who are the first time to use VidPaw, they would concern about the security of the services provided on site. Is VidPaw safe for use? Actually, VidPaw pay much attention to the safety of the site and will never give out any of user's personal information. Besides, VidPaw official website is completely safe for use - it contains neither pop-up ads nor dangerous virus, which provides a 100% safe site. 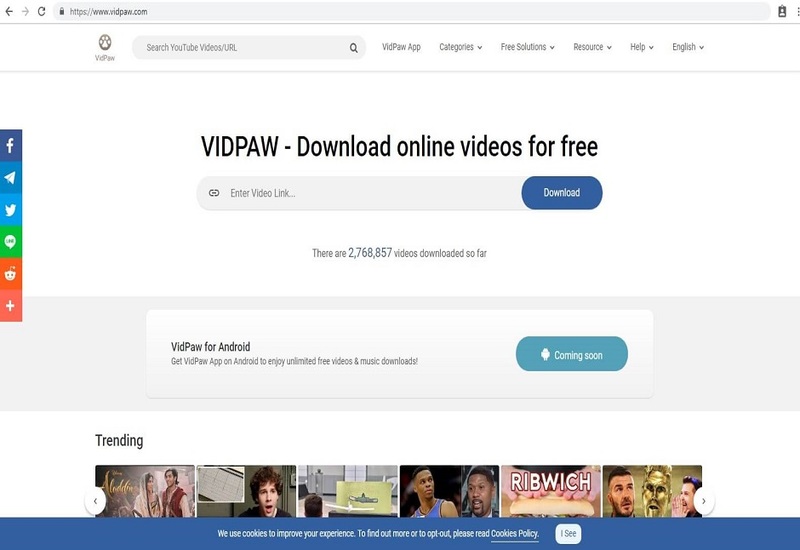 What's more, VidPaw will never ask you to download some malware while using VidPaw online services. Therefore, you can focus on the download process only while using VidPaw online video downloader. Part 3. How to Download YouTube Videos to PC with VidPaw? Because YouTube is the largest video streaming platforms and lots of people are finding the best way to download YouTube videos. So in this part, the tutorial on how to download YouTube videos to PC with VidPaw will be introduced to you. There are two methods to download YouTube videos with VidPaw. Go to YouTube and find out the YouTube video you want to download to PC. When you find it, play the video and copy its URL. Switch to VidPaw.com and paste the URL of the YouTube video to the frame bar in the middle of VidPaw homepage. Then hit "Download". When the information and output formats for the YouTube video is loaded, scroll down the page and you are free to select one for it. After deciding one, just hit "Download" to save it to PC now. STEP 4. Right Click "Save video as..."
Now you enter to the final step. When you find the video play in a pop-up window, just right click the video and select "save video as...". Then you can wait for appreciating the YouTube video on PC offline. STEP 1. Go to the video page of the YouTube video you want to download. Then edit the URL of the video page by adding "paw" behind "youtube", for example, www.youtubepaw.com/XXXXX. STEP 2. Hit "Enter" and direct to VidPaw video download page. STEP 3. Select your desired output format and quality from the list, and click "Download" to finish downloading the YouTube video. The convenience brings by VidPaw greatly satisfies users need to download online videos from different websites. This all-in-one online video downloader attracts lots of users ever since its launch. Try VidPaw if you need to download online videos!